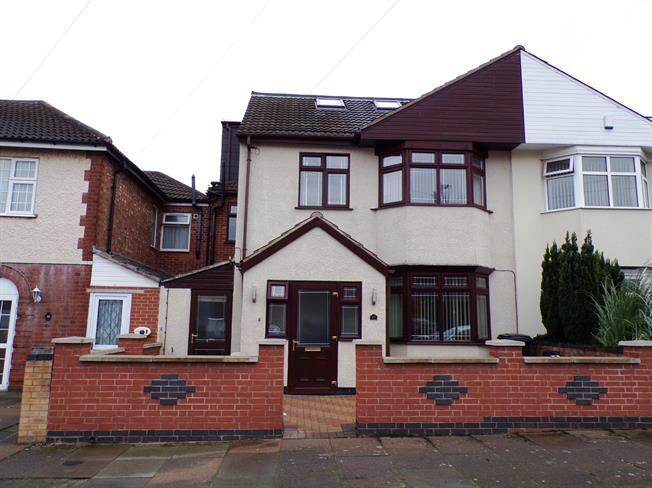 5 Bedroom Semi Detached House For Sale in Leicester for Offers Over £440,000. A well presented and deceptively spacious five bedroom semi detached property which has accommodation comprising porch, hall, walk in storage room, lounge, extended family room and spacious kitchen diner. On the first floor are four bedrooms and family bathroom. On the second floor is the master bedroom with walk in wardrobe and en suite bathroom. Outside the property has a small block paved frontage and a well maintained garden to the rear. The rear garden has a block paved patio, lawn, brick built shed with power, shower room with WC and walled boundaries. This fantastic extended property offers spacious accommodation throughout and would make the perfect family home. Early viewings are highly recommended.